Leave no trace hiking/camping has evolved from a concept originally called low impact camping. It became possible after lightweight camp stoves made it possible to cook without building a fire. Once camp fires are eliminated, coupled with some simple personal hygiene, it’s possible to walk to town without smelling like a Boy Scout as my mother used to say. Just as there are ultralight enthusiasts, there are leave no trace militants. To them no trace not only means no physical trace – not disturbing the ground or vegetation, packing out all garbage, burying human waste, no fires – but also very minimal visual impact. This translates to dark earth tone colors – backpacks, tents and clothing. The idea is to blend in so nobody even has to know you’re there. This idea has merit. Once, in Colorado, I was waiting for the golden hour at day’s end to photograph a stunning valley. Just as the light began to glow its reddish blush, a group of 30 rubber duck-yellow dots waddled across the valley floor destroying my shot. The next day I caught up with them to learn that Outward Bound dresses its students in yellow rain gear. At that point I decided to be invisible out of courtesy to others. Yesterday all that changed. 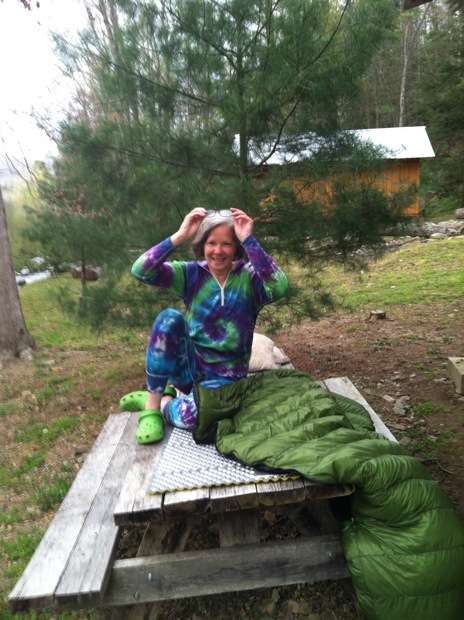 Tye Dye, a ’13 hiker I’ve been following posted an amazing photo of herself on trailjournals.com where she blogs about her hike. The colors jumped joyously into my head. Epiphany! Why hide in a trail civilization featuring shelters, zillions of people, picnic tables and enthusiastic folks like Tie Dye. Why not have some fun and broadcast happiness with bright, upbeat and positive colors. The bears don’t care. I wrote her a message crediting her with a saved soul. The back story is that Tye Dye’s daughter, a college senior, thought her base layer was dull. So, this artsy kid took matters into her own hands and generated a whole new brand and visual identity for dear mom. Bingo! My daughter, two years out of college, has a distinctively creative streak … maybe? Unfortunately I’ve already acquired a black and gray pack, but that’s where it ends. The sun will come up tomorrow, and when it does, I intend for me and it to be indistinguishable on the trail next year.